Slice onions, mushrooms, peppers and dates. Using oil from the allowance, first fry onions until soft and beginning to caramelize. 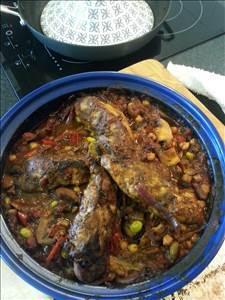 Put in a layer in the bottom of a tagine dish or casserole dish. Sprinkle with half of the chopped dates and cranberries. Repeat with the mushrooms and peppers and again layer into tagine. Drain the tinned chickpeas and put in layer in tagine with the frozen soya beans. Finally sprinkle on the remaining dates and cranberries. Remove chicken portions from spice mix, scrape of excess and retain. Place chicken on grill pan and spray lightly with oil from allowance, place under hot grill to lightly brown and seal. Mix chopped tomatoes with retained spice mix, add to hot pan you used for the vegetables and stir to incorporate any juices left in pan. Bring to boil and pour over vegetables in tagine (do not stir a tagine is meant to be a layered dish). Place the chicken portions on top nestling them down slightly to keep them moist during cooking. Place covered tagine into pre-heated oven 180 °C/gas 4. Cook for 30 minutes. Remove from oven and turn chicken portions, recover and return to oven. Lower temperature to 160 °C/ gas 2 and cook for a further 50-60 minutes turning chicken portions again if they start to brown to much. If sauce becomes too thick you can add a small amount of water. 41 members have added this recipe to their cookbook. There are 401 calories in 1 serving of Chicken Tagine. Calorie Breakdown: 14% fat, 47% carbs, 40% prot.